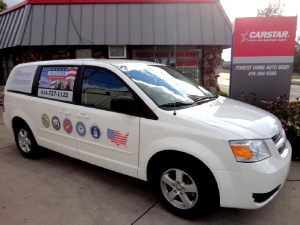 MILWAUKEE, WI (September 15, 2015) – CARSTAR Forest Home Auto Body has donated a 2009 Dodge Caravan to the Veterans Employment Alliance as part of the National Auto Body Council’s (NABC) Recycled Rides® program. Erie Insurance provided the van, and restoration was handled by Marty and Debbie Zabel, owners of CARSTAR Forest Home Auto Body in Milwaukee, WI, as well as their son who did all of the paint work. The Veterans Employment Alliance will use the van to shuttle veterans to and from work. The van was given away in front of thousands of people at the Hiller Ford 6th Annual MACC Charity Fund Car Show on September 13. Recycled Rides® is a nationwide community service project whereby members of the National Auto Body Council (NABC) repair and donate recycled vehicles to families and service organizations in need in their own communities. Recycled Rides recruits collision repairers, insurers, paint suppliers, parts vendors and others, to contribute in their own, yet synergistic ways. The number of CARSTAR stores who participate in the program has grown steadily since it began. In 2014, CARSTAR locations delivered nearly 20 vehicles to families in need. Pictured from left to right: Jeff Parmeter - Erie Insurance, Marty Zabel- CARSTAR Forest Home, C.J. Brown-VEA, Sue Gross-VEA volunteer.